UNLESS | Live. Learn. Love. Eat. As you know, the girls and I always do a lot of reading. We love to read all sorts of stories and fairy tales but especially love anything by Dr. Seuss. He always has a great way of both entertaining and teaching good values to kids (and adults) through his stories. Our favorite around here would have to be The Lorax. This story is about a selfish, greedy Once-Ler who only cares about making money and will destroy the whole world and everything in it to keep on making and selling his useless product to mindless consumers. This is a great story and a great message for anyone of any age. It breaks my heart to see how we continue to destroy our planet, waste precious resources, kill so many animals (directly and indirectly) and continually purchase things that we don’t need and never bring us real happiness. I wonder if enough people will ever wake up before it is too late. Or is it already? Don’t we see how we are being ripped off? We are paying such a high price for all of our cheap thrills. In exchange for all of the needless things we make, sell and purchase daily, we are giving up what we really do need in order to survive and thrive. We can’t get back the trees, fresh water, or all of the species that we are killing off. Plus, we do need air to breathe in order to stay alive! 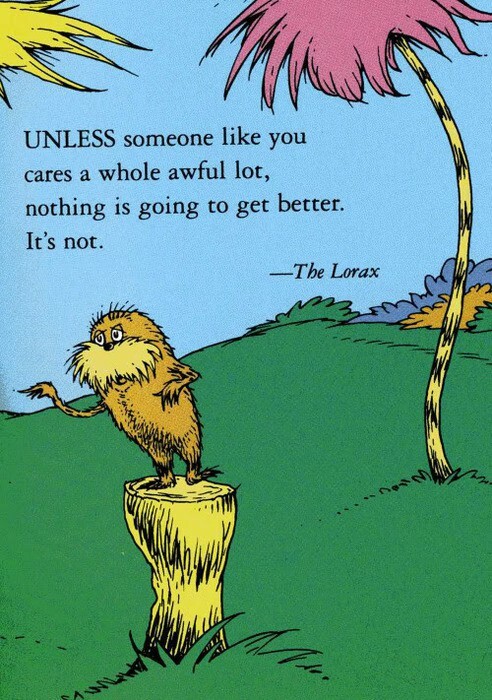 Here is the message of The Lorax and the reality of life.